To create an original, "out of the box" event for a high-end client. Instead of a typical dinner, our client wanted to create a special event that would leave a lasting impression on the well-traveled guests for its unique character and attention to detail. Marble House Mansion is a premier location for an event with its European-inspired elegance. Inside the mansion, every room is pristinely restored, transporting visitors back to the days of the Vanderbilt family. Stepping out onto the terrace, visitors overlook a sprawling lawn that leads down to the Atlantic Ocean and the Chinese Tea House, which was used by Alva Vanderbilt to host costume balls and suffragette rallies in the early 1900's. 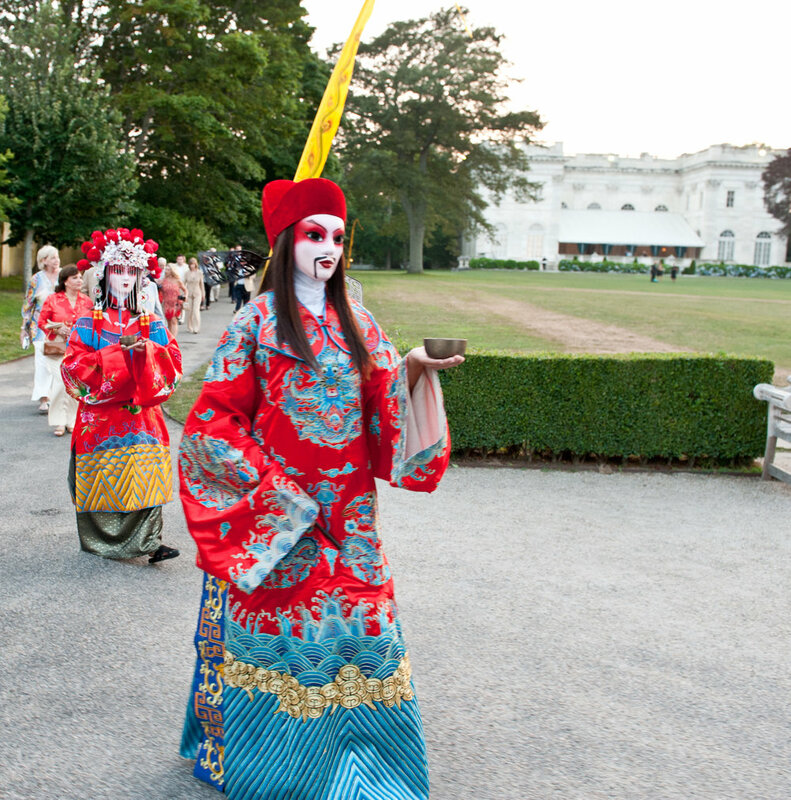 As our client wanted a one-of-a-kind venue to create the "wow" effect, Newport Hospitality immediately recommended an event utilizing both the Chinese Tea House and Marble House. Our guests arrived at Marble House Mansion in black limousines and passed through the grand marble foyer out to the terrace. After obtaining a specialty cocktail and admiring the waterfront view, guests followed a lantern lit path leading to the vibrant Chinese Tea House. They enjoyed their cocktails while marveling over the traditional Chinese music ensemble and the Chinese Bride and Groom living art. When the dinner hour neared, guests were escorted to the Gold Ballroom inside Marble House. They were greeted by a soft, magical ambience with hundreds of candles illuminating the décor adorning the walls and ceilings. Special touches made this evening truly memorable from the melodious sounds of the three-piece jazz trio to the gold-rimmed china at each place setting. Their three-course dinner was specially customized by the caterer's wine sommelier to pair the food with complementing wines. After dinner, guests strolled out to the terrace to sample espressos, cordials, and desserts from an all-white buffet. Focusing on elements of traditional Asian design, a customized menu, and authentic entertainment, Newport Hospitality created an event that satisfied the client's vision of a unique evening while retaining the highest level of service.